Time to start cranking up the awareness campaign on the book and our “Connection Storymaker App,” that have arisen out of the workshops Dorie Barton, Brian Palermo and I have been running for the past three years. Stay tuned, lots to come in the next few weeks. We’re just getting started. It’s time to start quietly talking about the new book and app that Dorie, Brian and I have been working on all year. We’re very proud of the book. Actually, I’m extremely proud of the book as it is even more the fulfillment of why I left academia and moved to Los Angeles 20 years ago — even more than my first book. 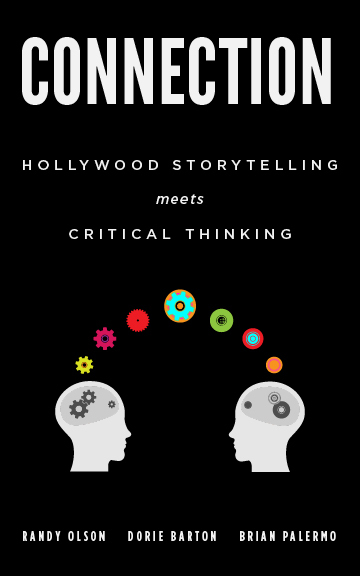 With this book, I have connected with two artists for a deeper understanding of the central dynamic of broad communication through the use of storytelling/narrative structure. I chose to team up, not with a couple of professors (which would have been going further in the cerebral direction), but with two actors (more in the visceral direction). Together we have crafted a simple, original model for story development, then created an app that should be popular as a tool for finding the core of your stories for broad communication. In a few days I’ll have more to say about the app and a series of live events we’ll be staging this fall as we roll out these communications tools, starting with a big wingding in Kansas City, September 12. We’re just getting started.